After deliberating for only five hours, a federal civil jury found insufficient evidence to prove a price-fixing conspiracy by the owner of Macy’s department stores in the high-end tableware market. Plaintiffs alleged that Macy’s owner Federated Department Stores conspired in 2001 with former competitor May Company to force tableware suppliers to boycott Bed Bath & Beyond. Subsequently, in 2003, May was purchased by Federated. Prior to trial, tableware suppliers Wedgewood Waterford and Lenox, which had also been named as defendants in the alleged conspiracy, settled out of the case. Northern District of California Judge Vaughn Walker certified the matter as a class action, thus exposing the remaining defendants to potential treble damages of over $41 million. Even before the consumer plaintiffs filed their civil suit in 2004, the New York state attorney general had completed a probe of the alleged price-fixing scheme, reaping almost $3 million in civil penalties from Federated, May, Wedgewood Waterford and Lenox. Nevertheless, even though the financial exposure in a civil trial was substantially higher, Federated viewed the trial as an opportunity to clear its name in the matter by showing that all of its communications were conducted appropriately and in the normal course of business. Most importantly, there was no evidence of an agreement among the alleged co-conspirators to boycott Bed Bath & Beyond. Following the defense verdict, jurors indicated that this lack of direct evidence had been fatal to the plaintiffs’ case. Defendants were ably represented at trial by a Jones Day team including Martha Boersch, Jeffrey LeVee, Thomas Demitrack, Eric Enson, and Kate Wallace. Think Twice provided courtroom graphics consulting, production and presentation services. In one of the largest public corruption verdicts in California history, a jury deliberated only three hours before returning a unanimous verdict in favor of the City of Compton, awarding the city nearly $22.5 million on its cross-complaint against Hub City Solid Waste Services, Inc. and its owner, Michael Aloyan. Hub City Solid Waste Services, Inc. v. City of Compton, Los Angeles County Superior Court Case No. BC 323801. The case involved allegations of bribery and political corruption in the award of a $100 million municipal waste hauling contract. 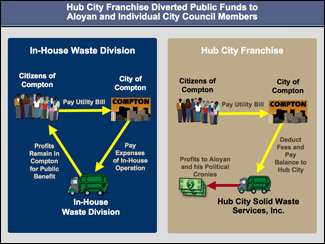 The City of Compton terminated the 15-year, no-bid franchise agreement after discovering that the franchisee had made hundreds of thousands of dollars in unreported "political campaign contributions" to three of the city councilpersons who voted to award the lucrative contract, and after the franchisee was convicted of bribing an official in a neighboring city. The franchisee sued, and the city counter-claimed to establish that the contract was void pursuant to a statute making it illegal for a public official to have a financial interest in a public contract made by him in his official capacity. In the first phase of the trial, the city successfully established that the individual cross-defendant was the alter ego of the corporate franchisee. Later, the trial court granted the city partial summary judgment, eliminating at least $10 million of potential damages exposure. The court ruled as a matter of law that the city legally terminated the franchise agreement in September 2004, based on the franchisee's bribery conviction. Then, in the final phase of the trial, the jury decided that the franchise agreement was obtained in violation of a state law making it illegal for any city official to have a financial interest in a public contract, and awarded damages of nearly $22.5 million to the City of Compton. Working with the city's trial team led by Gary Goodstein of Goodstein & Berman LLP, Think Twice provided courtroom graphics consulting and production services for the trial. Wal-Mart Stores Inc., the world's biggest retailer, must pay at least $78.5 million for violating Pennsylvania labor laws by forcing employees to work through rest breaks and off the clock, a Philadelphia jury found recently. Plaintiffs' lawyer Michael Donovan will also seek another $62 million in damages because the jury found that Wal-Mart acted in bad faith. Common Pleas Judge Mark Bernstein is expected to rule on that issue in the next few weeks. This victory for Wal-Mart's Pennsylvania employees follows a similar triumph last year in California, where an Alameda County jury awarded $172 million to employees in that state for meal break and rest break violations by the world’s largest employer. In both the Pennsylvania and California trials, Think Twice provided on-going visual consultation, demonstrative exhibit production and video editing services to the plaintiffs' attorneys beginning before trial, and continuing throughout. Persuasive graphics included illustrations of Wal-Mart's labor cost policies, timekeeping system, audit history, pay records, understaffing, knowledge of violations, and damages. Think Twice also performed extensive editing and preparation of numerous video depositions, particularly of senior Wal-Mart executives. In the Pennsylvania case, Hummel v. Wal-Mart Stores, Inc.,the juryawarded the exact amount the plaintiffs sought, rejecting Wal-Mart's claim that some employees chose to work through breaks and that the loss of a few minutes' pay here or there was insignificant. Payments to each plaintiff are expected to range from about $50, on up to a few thousand dollars, depending on how long they worked for the company. Wal-Mart must pay the plaintiffs' legal fees on top of the award. The Pennsylvania class-action suit involves 187,000 current and former employees who worked at Wal-Mart and Sam's Clubs from March 1998 through May of this year. The jury found that Wal-Mart broke its contract, thereby violating state labor laws. Trial counsel for plaintiffs and the class of employees were Michael D. Donovan, Esq. of the Philadelphia law firm of Donovan Searles, LLC, Judith L. Spanier, Esq. of the New York law firm of Abbey Spanier Rodd Abrams & Paradis, LLP, and Rodney P. Bridgers, Esq. of the Colorado law firm of Azar & Associates, P.C. This verdict, Mr. Donovan said, "should send the message to corporate America that you can't say one thing and do another ... and that you should put people ahead of profits." Eleven months earlier, after a three-month trial in Alameda County, California, a jury found that Wal-Mart illegally prevented thousands of its workers from taking meal breaks. The jury in Savaglio v. Wal-Mart Stores Inc. awarded $57.3 million in compensatory damages and $115 million in punitive damages to a class of about 116,000 current and former Wal-Mart employees. The successful California plaintiff class was represented by Frederick Furth, Jessica Grant, and a number of other attorneys at Furth Lehmann & Grant LLP, a nationally recognized class action law firm based in San Francisco. The verdict is the largest ever in a meal-break class action in California. "I'd say that's pretty huge," Mr. Furth said. "We're very pleased with the result." Similar suits against Wal-Mart are pending in a number of jurisdictions around the country. Lawyer Franklin D. Azar of Aurora, Colorado, who worked on the California case and an earlier suit in Colorado that was settled by the parties, believes these verdicts have "set a benchmark for what the rest of these cases are worth." Working with the Los Angeles office of Quinn Emanuel, Think Twice provided extensive support for the trial of a business interruption insurance matter. But this was no ordinary insurance coverage case, as the end client's losses resulted from several hundred terrorist bombings of an oil pipeline, over a two-year period, in South America. To prevail, Quinn Emanuel had to prove that the losses incurred by their international energy client were due to coordinated terrorists' attacks, thereby having a common cause and purpose. The insurance companies' contention was that each bombing was a separate 'cause' of loss and therefore subject to a separate deductible (which would have meant no coverage). Quinn Emanuel brought Think Twice in early, months in advance of the seven-week trial, to learn the ins and outs of the case and come up to speed on the overall oil production and pipeline repair process. We provided PowerPoint presentations for pre-trial hearings, and then went to work to create a myriad of highly-illustrative still and animated PowerPoint and Flash graphics that visually informed the jury of these processes, all the while clearly demonstrating that these terrorist attacks were indeed coordinated. Clearly our client's trial presentation hit home – the jury returned with a unanimous finding for the client pertaining to the issues of liability, and now the case is proceeding to a damages trial in 2007. In another matter, just weeks before the start of trial, Quinn Emanuel retained Think Twice to help develop the graphics needed in their new case – a $135 million insurance coverage dispute that had been in litigation with other law firms for over 13 years. The plaintiff, a government defense contractor, was seeking reimbursement from Quinn Emanuel's client for its costs to clean up contaminated groundwater at a Superfund site near Los Angeles. Plaintiff claimed that the $135 million it spent cleaning up the pollution was covered under 'bodily injury and property damage' insurance contracts issued by the firm's client, arguing that its clean-up costs were reasonable and necessary costs to defend toxic tort and property damage lawsuits filed against it as a result of damages caused by its pollution. Think Twice designed a comprehensive, animated PowerPoint presentation, as well as multiple still graphics, for use in the trial to help the jury understand that the plaintiff’s 'claims' were without merit, helping them argue that the clean-up was not reasonable and necessary for the defense of the lawsuits, but was instead necessitated by the EPA's orders. After just a few weeks of trial, and based on the strength of the opening arguments and supporting graphics, the plaintiff quickly moved to settle the case and Quinn Emanuel obtained a very favorable settlement on behalf of the defendant. "Your team's ability to tackle both the horrific time constraints and the intricacy of the case was tremendous. You moved in concert with both client and legal counsel, with wisdom and grace under incredible pressure."